The Calendar Display Options pop-up menu. Switching views is easy. 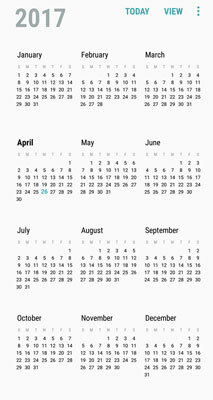 For example, just tap the Month link at the top of the calendar, which in this case displays Apr 2016, to bring up the options. These are shown here. If you tap Week, you see the weekly display, as shown. 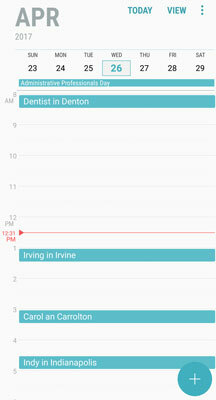 Or tap the Day button at the top of the calendar to show the daily display, as shown. To see what events you have upcoming, regardless of the day they’re on, you might prefer List view. 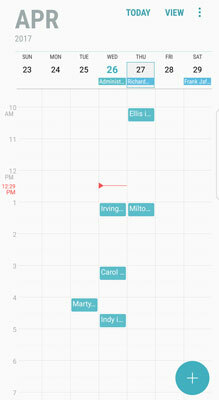 Tap the List button at the top of the calendar to see a list of your activities. The weekly and daily calendars show only a portion of the day. You can slide the screen to see the time slots earlier and later. You can also pinch and stretch to seem more or less of the time slots. There is also an annual calendar, as seen here. This is so busy that it does not allow you to see any appointments. It is primarily useful for setting dates out in the future.